The Feast of Christ the King is a moveable feast that occurs on the last Sunday of the Liturgical year. It is an important feast for all of us! 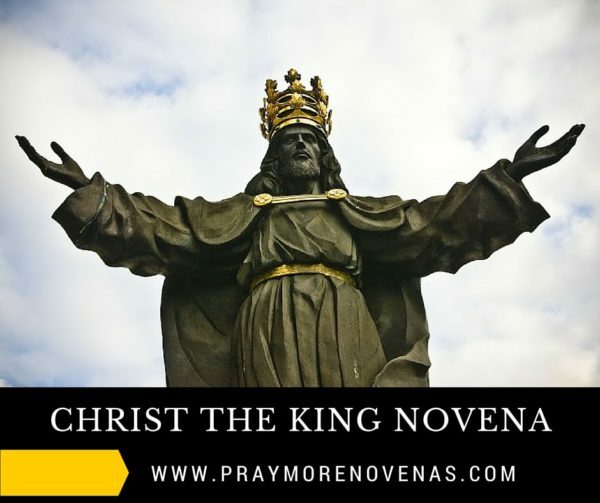 Let’s join in preparing for this feast with a Novena for Christ the King! This feast day was instituted by Pope Pius XI on December 11th in 1925 within the encyclical letter Quas Primas. The Holy Father was responding to the fact that the world was becoming increasingly nationalistic and secular. Governments were claiming more and more allegiance from their citizens and attempting to replace God. Pope Pius XI, therefore, created this feast to help the faithful to remember that allegiance to Christ is above any allegiance to government of a nation. It is particularly important to recognize the words of the encyclical in today’s climate of government intrusion on the Church. Let us pray to Jesus the King of all nations, he is Christ the King! As I reflect on Your second, glorious coming and the judgement of all mankind, I beg You to show me mercy and give me the grace to become a great saint. I pray that not only will I spend eternity with You but that You may use me – a sinner – to bring others into Your Kingdom for Your glory. Christ the King, Your Kingdom come! As I reflect on Your second, glorious coming and the judgment of all mankind, I beg You to show me mercy and give me the grace to become a great saint. I pray that not only will I spend eternity with You but that You may use me – a sinner – to bring others into Your Kingdom for Your glory.